Featured on the soundtrack, Music Inspired By The Motion Picture Amazing Grace, and written by 2006 two-GRAMMY nominee and the Gospel Music Association’s Artist of the Year, Chris Tomlin, “Amazing Grace (My Chains Are Gone)” will be sung on Amazing Grace Sunday February 18. Over 3,600 North American churches from all 50 states and 10 provinces have already signed up to sing “Amazing Grace” and pray for the end of slavery as an estimated 27 million men, women, and children are still enslaved around the globe. Churches in the United Kingdom are joining together for Amazing Grace Sunday March 25. In addition to the traditional hymn, churches are encouraged to download Tomlin’s music and lyrics of his adaptation of Amazing Grace for use as bulletin inserts on Amazing Grace Sunday (www.worshiptogether.com/amazinggrace). To hear a clip of Chris Tomlin singing “Amazing Grace (My Chains Are Gone)” and for more information on Amazing Grace Sunday or to register to participate, visit www.amazinggracesunday.com. 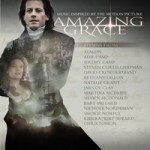 A moving visual/lyrical history of the song “Amazing Grace,” set to Chris Tomlin’s adaptation of the song, can be downloaded at http://www.amazinggracemovie.com/video/amazinggrace_story-of.mov. The story includes when the song has been used to inspire hope, even during tragic times in history: It was sung by both sides of the civil war, on the day Dr. Martin Luther King shared his dream, when the Berlin wall came down, on September 11 and when the saints marched back into the Superdome after Hurricane Katrina, and more. In addition to Tomlin’s “Amazing Grace (My Chains Are Gone),” the Music Inspired By The Motion Picture Amazing Grace soundtrack, which released January 23, fittingly showcases other modern day versions of period hymns performed by today’s top Contemporary Christian, Gospel and Country artists. Highlights of the “Inspired By” soundtrack for the Samuel Goldwyn Films/Roadside Attractions/Bristol Bay Productions film include Country Music Award-winner Martina McBride’s powerful version of “How Great Thou Art” and selections from Grammy Award winners Jars of Clay and Steven Curtis Chapman, Gospel music stars Smokie Norful and Kiki Sheard, best-selling group Avalon, GMA 2006 Female Vocalist of the Year Natalie Grant, and Bart Millard of the platinum-selling group MercyMe. Directed by Michael Apted, Amazing Grace stars Ioan Gruffudd, Romola Garai, Rufus Sewell, Benedict Cumberbatch, Youssou N’Dour, Ciaran Hinds, Michael Gambon and Albert Finney. The film was written by Academy Award® nominee Steven Knight, executive produced by Jeanney Kim and produced by Terrence Malick, Edward Pressman, Patricia Heaton, David Hunt and Ken Wales. Amazing Grace is a presentation of Bristol Bay Productions in association with Ingenious Film Partners. Amazing Grace will be released in the United States by Samuel Goldwyn Films and Roadside Attractions on February 23, 2007.